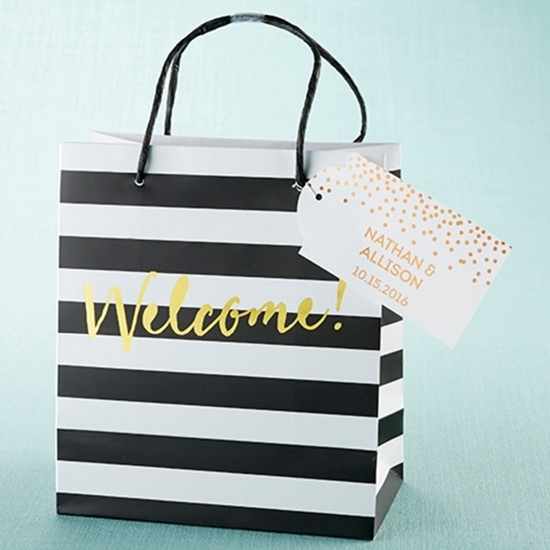 Greet your guests with these black and white striped welcome bags which feature a gold 'Welcome!' message. It measures 7.9' w x 9' h x 4.1' d. Bags are sold in sets of 12. (tag not included). Welcome your guests with this chic welcome bag striped in black and white. For celebratory events, guests make the party lively and full. The guests invited for your big day are usually your loved ones, family that have watched you grow, explore the world, make mistakes, succeed, cry, laugh and just being yourself. In a way, you would not have become the person you are without them. The guests are there to support as two individuals join the hands of another. Make them feel welcome and appreciated and recognize their encouragements with little gifts of acknowledgements.